The snow is just coming down like crazy … you should see it! This is our second visit to Lake Tahoe during “winter.” Technically, it’s not winter yet, but this is the second time we’ve been snowed in. I am overjoyed about that. … and here’s the tree in front of our condo. Don’t let that blue sky in the background fool you. It grayed right up again and started snowing within minutes of this shot. Yay! I had planned to make chili, but for some reason today, spaghetti and meatballs sounded better. So that’s what’s in the crock pot right now. This is the simplest way I know to make meatballs. You pretty much can’t go wrong. 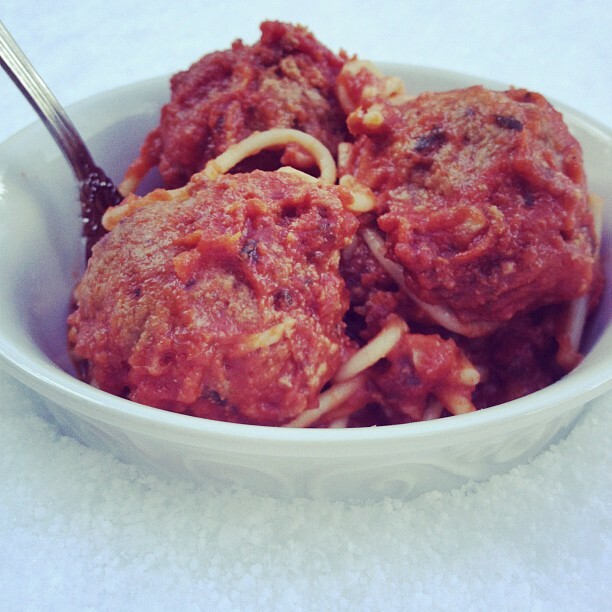 Before you begin, add the spaghetti sauce to your crock pot and turn on high to heat up while you make the meatballs. In a medium-sized bowl, grate the leftover dinner roll or the dried bread, or add the 3/4 cup of dried breadcrumbs. Add the egg, minced garlic, pesto, seasonings, cheese and milk and mix well. Let sit five minutes. Add hamburger and mix well with your hands. Shape into large meatballs. 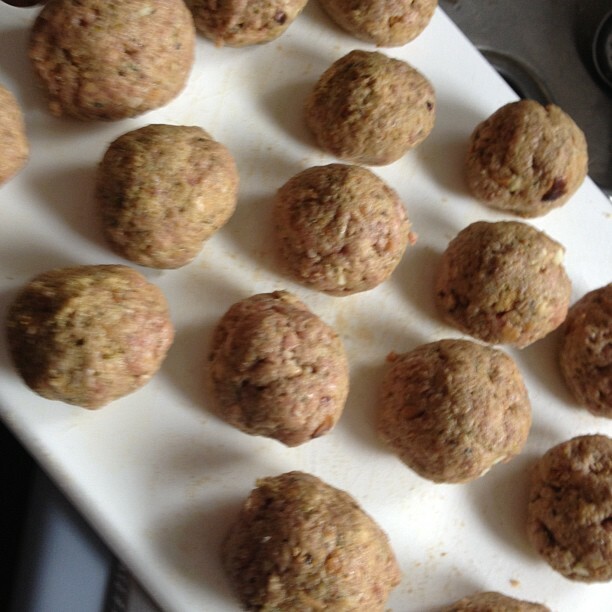 My batch made 20 giant meatballs. 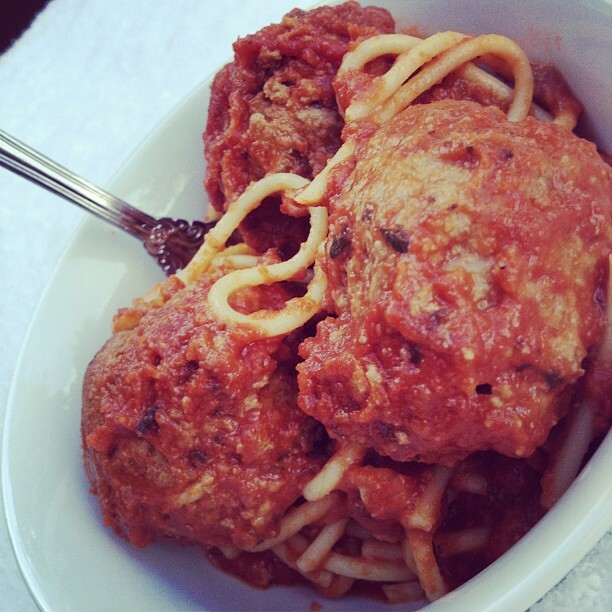 Carefully place meatballs in spaghetti sauce in crock pot, being careful not to break them apart. Cover the pot and leave them undisturbed for at least one hour. If you stir before then, the meatballs are likely to break apart. After an hour, carefully stir the sauce. Turn crock pot to low and let simmer another 3-5 hours. 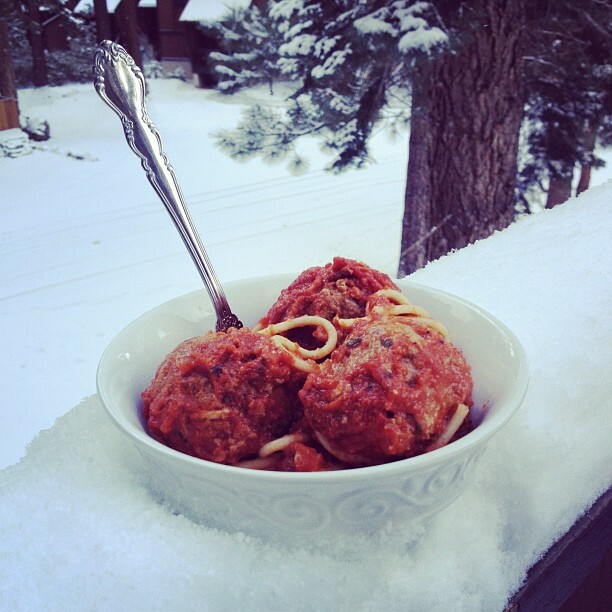 If possible, I suggest eating these out on your snowy balcony.